It is true, seeing a cabs colors and design take shape from stone is amazing. Equally amazing is having the privilege of seeing Teddi's lapidary skill, and enjoying her friendship. It is beyond words. 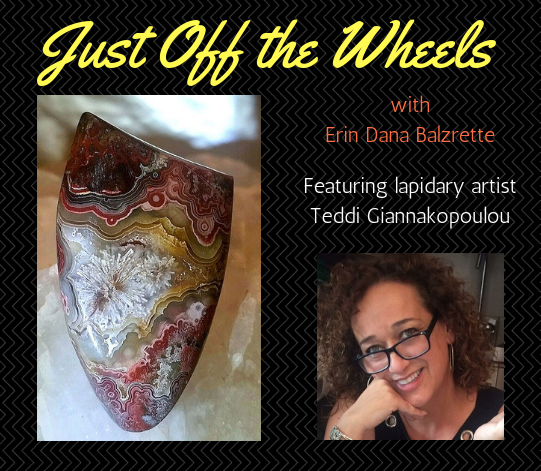 A wonderful person, gifted artist, true friend, and amazing soul, please enjoy this 'Just Off the Wheels' chat with Teddi Giannakopoulou. Teddi Giannakopoulou: I absolutely admire all the stones, but Crazy Lace is by far one of my favorites, for now. For me, Crazy Lace is like a magical surprise with every turn of the polishing wheels. The waves, the colors, and patterns of nature never cease to amaze me. There’s something old fashioned about its look with a modern flair. Cute story; the first time my youngest son saw a Crazy Lace cab he was in awe and wanted to know how in the world I painted it so perfectly. That cab is in his reserved private collection now. 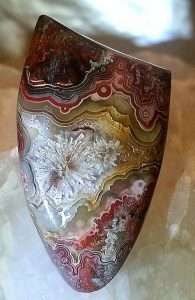 About four years ago, my husband, who does beautiful lapidary work, gifted me, with great enthusiasm, a six Saturdays (5 hours each class) course. How odd of a gift I thought to myself. Not wanting to hurt his feelings, I went to the class. The instructor asked everyone what their goal was for being there. When it was my turn to answer, I said I did not want to offend anyone, but I had no goals or intentions of using this new found skill and was rather there to have fun. Well, we all know how that turned out. Talk about love at first sight. OMG, the beauty of the rock as it turned into a cab was magnificent and mind-boggling. It took me three Saturdays to finish the first cabochon which was a beautiful Brazilian Agate. Yes, 15 hours from start to finish…but I was happy, proud and absolutely hooked on cutting. We have two lapidary machines now and needless to say, Elias has not been able to go near one in over four years…they are my babies. This particular cabochon was easy in deciding which direction it was going to be cut. I wanted to capture all the elements it offered; starbursts, colors, lines and the shape all came naturally with such a pretty slab. I think it turned out well. TG: A new cutting approach that I would love to master soon is intarsia. I also would like to become more comfortable with boulder opals. I consider them to be magnificent when done right. TG: My advice for anyone trying their hand at this art is to not be rigid about shapes, styles, or fears of getting hurt using the equipment. Once you create something, I promise you will not want to stop. Go to shows, meet people who love the same art and talk to rock hounds. Save all your scraps. Be yourself because there is no right or wrong in your creative style. Expect to be frustrated when a cab is giving you trouble, like scratches, breaking etc. 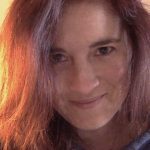 Put it down, walk away, and start working on a new one. In time go back to it…somehow walking away from it and picking it up later seems to be a solution. TG: My motivation is seeing the finished product as perfect as it can be done, and the excitement it creates for a buyer. My favorite part is naming the cabs and giving them a bit of their own personality by doing so. (The cabochon featured) is named “Independence Day."